Tia Brown McNair, Estela Bensimon, Michelle Asha Cooper, Nicole McDonald, Thomas Major, Jr.
To truly become student-ready, educators must make difficult decisions, face the pressures of accountability, and address their preconceived notions about student success head-on. 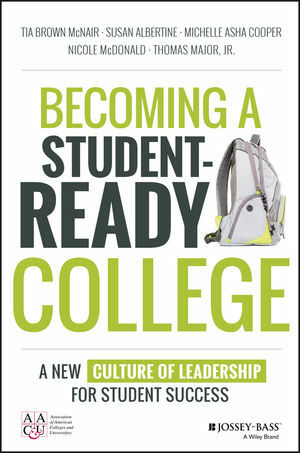 Becoming a Student-Ready College provides a reality check based on today's higher education environment. TIA BROWN MCNAIR is the vice president for diversity, equity, and student success at the Association of American Colleges & Universities (AAC&U). SUSAN ALBERTINE is senior scholar for faculty at the Association of American Colleges & Universities (AAC&U). MICHELLE ASHA COOPER is the president of the Institute for Higher Education Policy. NICOLE MCDONALD is a strategy officer at Lumina Foundation. THOMAS MAJOR, JR. is corporate counsel at Lumina Foundation. American Association for Colleges & Universities (AAC&U) is the leading national association concerned with the quality, vitality, and public standing of undergraduate liberal education. Its members are committed to extending the advantages of a liberal education to all students, regardless of academic specialization or intended career. Founded in 1915, AAC&U now comprises more than 1,300 member institutionsincluding accredited public and private colleges, community colleges, research universities, and comprehensive universities of every type and size.